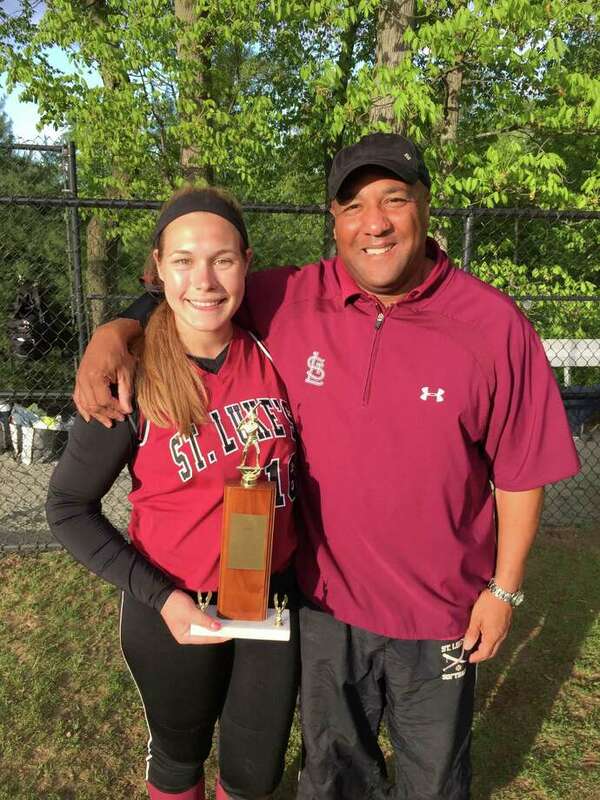 Marissa Ruschil, a senior, was the winning pitcher in St. Luke's 2-1 FAA title win; she also collected an RBI.Ruschil is pitcured with the trophy and coach Troy Haynie. In a matter of three batters, St. Luke's varsity softball's bid for a third FAA title in four years went from a foregone conclusion to a nearly improbable scenario. That was before junior second baseman Ali Trager dove to catch a two out, bases loaded line drive to secure a rollercoaster 2-1 win over the School of the Holy Child on a blustery Wednesday evening in New Canaan. Marissa Ruschil, the St. Luke's ace who entered the game with a miniscule 1.70 ERA and 10-0 record, set down the Holy Child batters with ease through the first six innings, collecting eight strike outs in seven innings of work. Ruschil, one of four seniors on the roster, retired the first two hitters in the top of the seventh before Holy Child's pitcher, Molly Leitner, laced a single into center. Elizabeth Curcio, the Gryphons' cleanup hitter, followed with a single of her own. With the final out now eluding the Storm, Stephanie Kireopoulos dribbled a grounder that plated Leitner to cut the St. Luke's lead to 2-1. Caroline Bryceland, who had reached in all three plate appearances, strode to the plate with the season in the balance. Holy Child's first baseman slapped Ruschil's offering toward second, where Trager lunged. She did not return to her feet until the pile of teammates that swarmed her lifted her off the ground. Following the game, Ruschil reflected on the win-and the catch. "I was so relieved," she said. "I just ran over there [to Trager]." Reveling in her third league championship, the Dickinson College-bound slugger expressed her happiness. "I couldn't ask for more," she said. St. Luke's, which downed King 13-0 in the semifinals Monday, aimed for a different result than last year's title game loss to Greenwich Academy. Indeed, the Storm found a similar result to the 2013 championship game, when Ruschil slugged a three run homer in the sixth to secure the trophy. This year it was Noelle Ruschil-Marissa's younger sister and freshman batterymate-who delivered the keynote. Her first inning triple off of Molly Leitner plated the game's first run. She then crossed the plate on her sister's RBI groundout. St. Luke's bats were held at bay from there, as Leitner allowed just five more baserunners the rest of the way. She struck out nine in a losing effort.